The HF301 is a non-venting piston-sensed high-flow pressure regulator for gas or liquid applications with a balanced main valve design. The liquid version includes a Vespel® seat, whilst the gas version features PEEK™ seating. 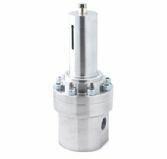 With a balanced main valve design it can provide stable control with a high level of accuracy under varying inlet pressures. Its high flow coefficient ensures the HF301 can also cope with higher flow rates.